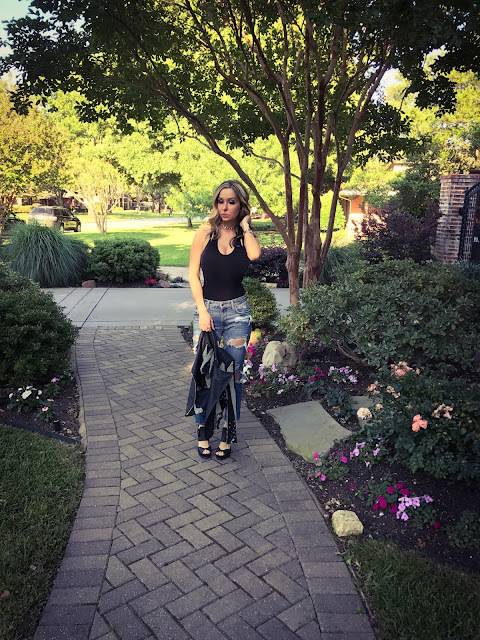 There is a time and a place for distressed denim and one fabulous blazer. It's those two magic words-- Girls' Night! Distressed jeans are a staple in my wardrobe. These jeans are a cropped version, so they're perfect for showing off your favorite heels. Now there's one main thing to keep in mind when purchasing denim like this -- where is it distressed? If the jeans are distressed around the knees, the holes will become more exaggerated as you wear them (which is precisely the point). Every time you are sitting, driving a car, etc. the distressed areas will tear and shred further. 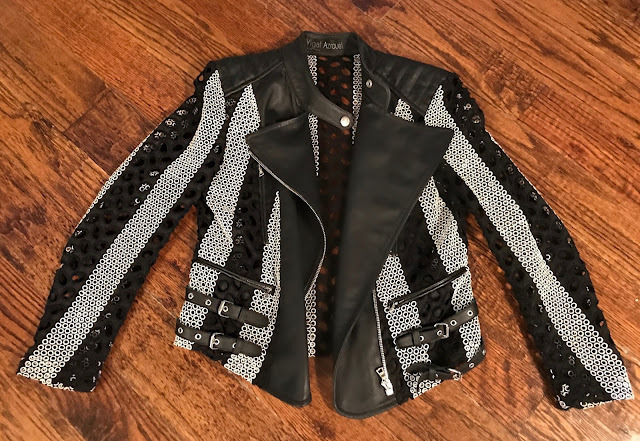 And here's a closer look at this statement jacket. This jacket makes the looks! Without this piece, my Girls' Night outfit would have consisted of a black bodysuit, denim and heels. Yawn. There should always be a minimum of one item in your outfit ensemble that is a stand-out piece. Speaking of bodysuits. If you do not own a simple black bodysuit, allow me to I suggest this one. And I know you are wondering this, so I'll answer before you even have to ask. Yes, some bodysuits are just one giant wedgie. No bueno! I'm happy to report that this bodysuit is not like that whatsoever. It's über comfortable, reasonably priced, and a very soft fabric; all together making for a great base layer for any outfit. The back is extra fun too. Plunging, not too revealing and tasteful. 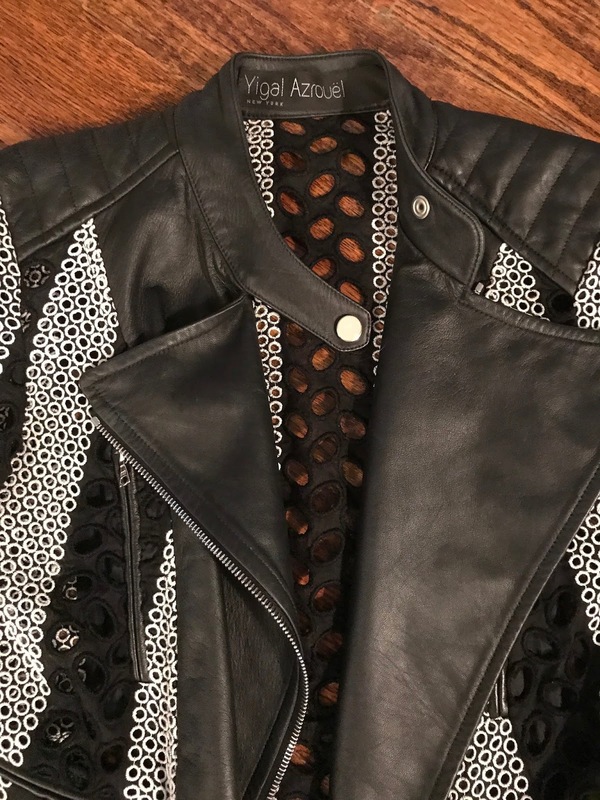 I wore my jacket the entire evening, except for when we were dancing at The Weeknd concert. What an amazing night that was! Now we all know that no outfit is complete without the proper accessories. 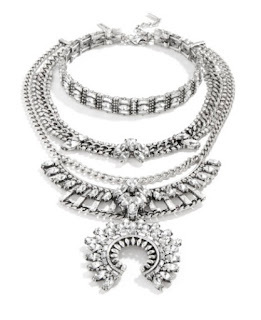 For jewelry, I always love to wear gold and silver together (or as I often refer to it-- mixing warm and cool tones). I chose a staple Bauble Bar rhinestone choker paired back to a gold-filled St. Raine lariat necklace. Now here's the secret with Bauble Bar. 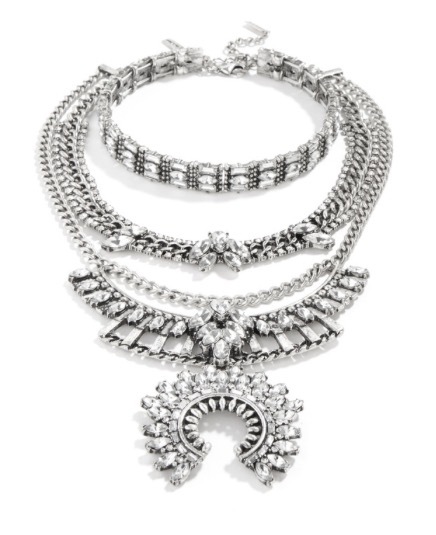 I purchased this statement necklace (shown above), but the choker is not attached to the bib necklace. So basically you get two different looks for the price of one. I wear this choker all the time . . . probably too much. But it's just so much fun! 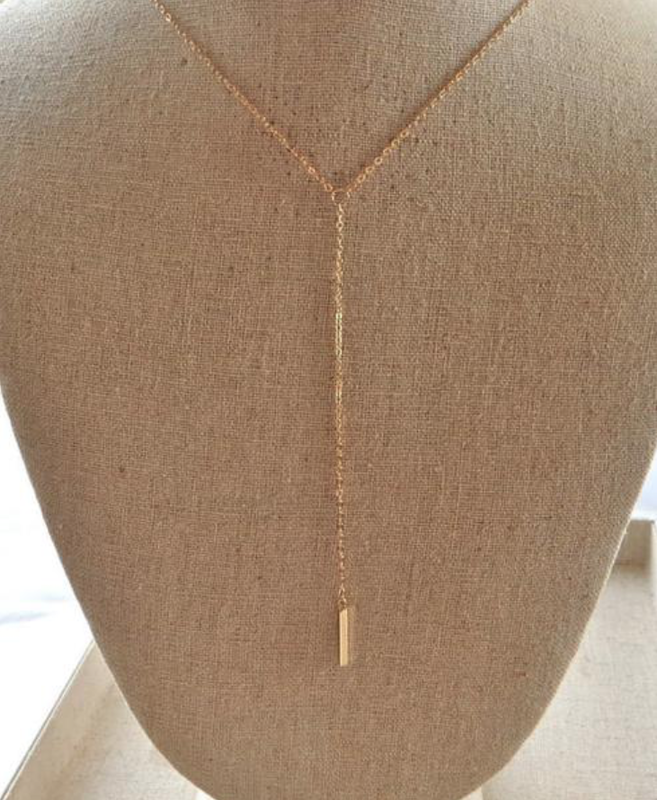 If you are not a huge fan of chokers, and prefer a staple piece, this St. Riane lariat necklace is stunning! 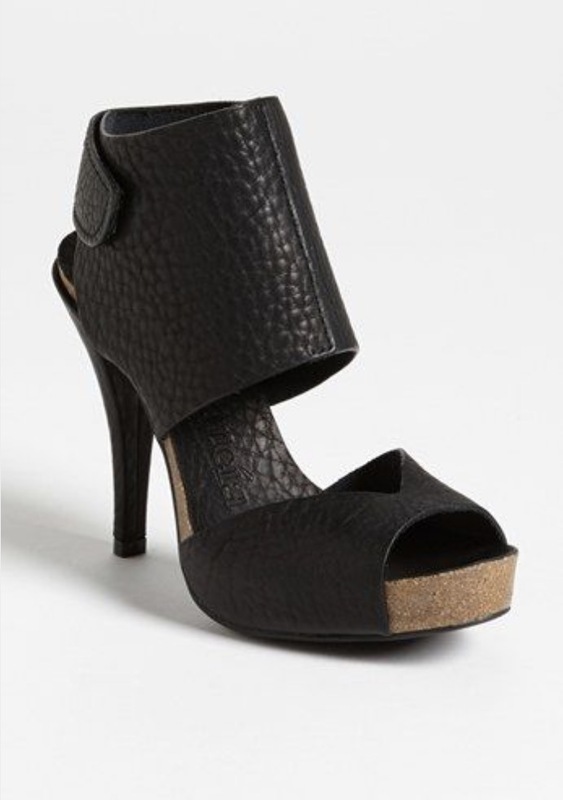 And last, but certainly not least-- SHOES!!! If you do not own a pair of Pedro Garcia shoes, you are missing out. This style, tagged the Piper, is Pedro Garcia's signature shoe. Until you try this brand, you have no idea what comfortable shoes feel like! It wasn't until I started my first job in retail at Nordstrom (being on marble floor for 8-10 hours at a time), when I discovered this incredible brand. I refer to Pedro Garcia as fashionable, orthopedic shoes. The cork sole is extremely supportive, lightweight, and the shoe hugs your feet. St. Raine Lariat Necklace: Here (Use code LAURASTYLE for 10-15% off your entire order). And be sure to check out my brand new full biz website: www.life-stylebylaura.com . My blog "Skinny in Heels" is now integrated into my site. XO!